There are 2 main colors available for the Trays. Dark Green and Clear. 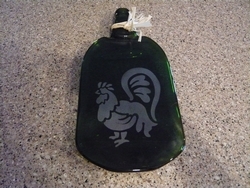 I will sometimes have large Cobalt Blue bottles....if you order one I will let you know if they are available. Army, Navy, USAF & Marines. Also Firefighters and Law Enforcement designs are available. Just mention the design you would like in the COMMENT section when you order. Beautiful Sun Face to brighten your day. Native American Petrocliff designs are very artsy. A majestic Elk. Perfect for the cabin! It's a "Walk in the Woods" for the Moose and the Bear. 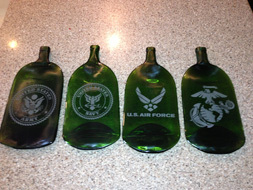 Molded bottles, slumped into the shape of a bowl.